On Sale Now! Free Shipping Included! 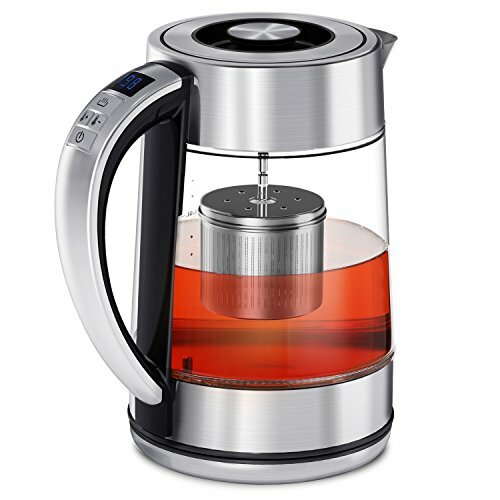 Save 6% on the CISNO 2 in 1 Electric Tea Kettle With Infuser, Glass and Stainless Steel Body with Variable Temperature Control, Cordless, 1500W 1.7L (BPA-Free) Perfect for Loose Leaf Tea, Blooming Tea by CISNO at Amina Restaurant. MPN: NCC-C013. Hurry! Limited time offer. Offer valid only while supplies last. BREWING ANY TYPES OF TEA - Built-in 100% stainless steel infuser suit for all types of tea brewing. Plunging tea infuser allows you to raise and lower the tea strainer for customizable flavor without opening the lid of kettle. Suitable mesh of the tea strainer can prevent the spot leaf tea from dripping to the water, so it's great for loose leaf tea and also perfect for bagged tea, blooming flower tea. VARIABLE TEMPERATURE CONTROL - Water temperature is the most important for brewing tea, coffee, beverages and blends, this kettle can be adjusted temperature from 105°F to 212°F, the digital control panel of the handle allows you to observe temperature anytime. The keep-warm function can hold the selected temperature for up to 60min., so your water is ready at the temperature you want whenever you need it. FAST BOILING AND LARGE CAPACITY - When you need a quick cup, choose this kettle. 1500W power allows the water to boil in 6-8 mins., faster than microwave and stovetop. 1.7L capacity can provide 6-7 cups of tea, especially suitable for entertaining guests and friends. The blue LED indicator can let you know when kettle starts to boil or shut off. EXTRA SAFE & HEALTHY - 100% BPA FREE and FDA Approved. 304 Stainless steel and heat-resistant borosilicate glass make you stay away from the bad smell of plastic. The cool touch handle also protect your fingers from scald. CORDLESS & EASY CLEANING - The 360-degree rotating base design allows you to pick up the kettle from any angle. The wide-opening lid design make it easy to clean.